The Library of America presents Smith's finest work in the new collection, American Pastimes: The Very Best of Red Smith. It is available now and a must-read for all sports fans, young and old (and an ideal gift for Father's Day). This week, with permission from Smith's family, we'll reprint a Red Smith column every day to offer you a sample of what he was all about. Today's column is "A Little Greedy, and Exactly Right" which ran on June 11, 1973, two days after Secretariat won the Triple Crown. The thing to remember is that the horse that finished last had broken the Kentucky Derby record. 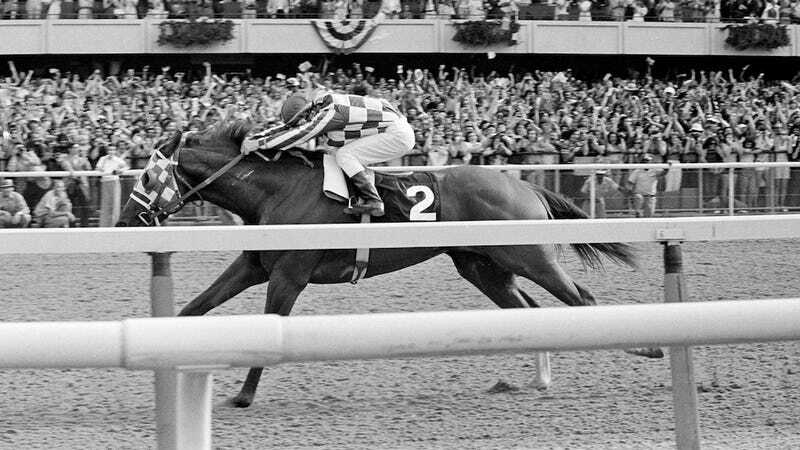 If there were no colt named Secretariat, then Sham would have gone into the Belmont Stakes Saturday honored as the finest three-year-old in America, an eight-length winner of the Kentucky Derby where he went the mile and a quarter faster than any winner in ninety-eight years and an eight-length winner of the Preakness. There is, however, a colt named Secretariat. In the Derby he overtook Sham and beat him by two and a half lengths. In the Preakness he held Sham off by two and a half lengths. This time he and Sham dueled for the lead, and he beat Sham by more than a sixteenth of a mile. There is no better way to measure the class of the gorgeous red colt that owns the Triple Crown. Turning into the homestretch at Belmont Park, Ron Turcotte glanced back under an arm to find his pursuit. He saw nothing, and while he peeked, his mount took off. Secretariat had already run a mile in one minute, 34 1/5 seconds. Up to three weeks ago, no horse in Belmont history had run a mile in less than 1:34 2/5. He had run a mile and a quarter in 1:59, two-fifths of a second faster than the Derby record he had set five weeks earlier. Now he went after the Belmont record of 2:26 3/5 for a mile and a half, which was also an American record when Gallant Man established it sixteen years ago. With no pursuit to urge him on, without a tap from Turcotte’s whip, he smashed the track record by two and three-fifth seconds, cracked the American record by two and a fifth, and if Turcotte had asked him he could have broken the world record. If he had been running against Gallant Man, the fastest Belmont winner in 104 years, he would have won by thirteen lengths. Unless the competition spurred him to greater speed. “It seems a little greedy to win by thirty-one lengths,” said Mrs. John Tweedy, the owner, and then repeated the rider’s story of how he saw the fractional times blinking on the tote board, realized there was a record in the making, and went after it in the final sixteenth. The colt was entitled to his margin and his record. At the Derby he drew a record crowd that broke all Churchill Downs’ betting records and he set a track record. He set attendance and betting records at the Preakness and may have broken the stakes record, but if he did discrepancies in the clocking denied him that credit. Last Saturday belonged to him. Indeed, Belmont was kinder to the Meadow Stable than Pimlico had been, in more ways than one. On Preakness day, while the Tweedy party lunched in the Pimlico Hotel near the track, a parking lot attendant smashed up their car. They walked to the clubhouse gate, found they hadn’t brought credentials, and paid their way in. While the horses were being saddled in the infield, somebody in the crowd accidentally pressed a lighted cigarette against Mrs. Tweedy’s arm. On his way back to his seat, John Tweedy had his pocket picked. The voices followed her to the paddock where her colt was cheered all around the walking ring. They followed as she returned to the clubhouse. Secretariat was cheered in the post parade, cheered as he entered the gate, and when he caught and passed Sham on the backstretch the exultant thunders raised gooseflesh. At the finish the crowd surged toward the winner’s circle, fists brandished high. After twenty-five years, America’s racing fans had a sovereign to wear the Triple Crown. Parallels are striking between this one and his predecessor, Citation. Both colts raced nine times as two-year-olds and finished first eight times. At three, each lost once en route to the Derby, Preakness, and Belmont. Both made each event in the Triple Crown easier than the last. After the Belmont, Citation won his next ten starts for a streak of sixteen straight. Secretariat’s stud duties won’t permit that. Love will rear its pretty, tousled head.